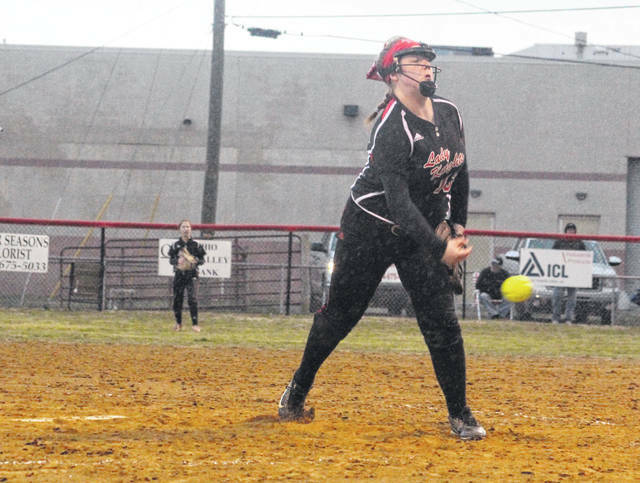 Point Pleasant freshman Kit Stroud delivers a pitch during a March 22 softball contest against Parkersburg South in Point Pleasant, W.Va.
POINT PLEASANT, W.Va. — One streak ended, so the Lady Knights started working on another. The Point Pleasant softball team had its eight-game winning streak snapped by Hurricane, but the hosts responded with come-from-behind victory over Independence in the night cap of a Saturday afternoon doubleheader in Mason County. The Lady Knights (10-2) ran into a buzzsaw in the opener with Hurricane as the hosts mustered only one hit and three total baserunners during a 10-0 setback. Point also trailed by a 5-2 count against Independence, but plated four runs in the bottom of the sixth to rally back for a one-run triumph. PPHS received a two-out walk in the second and a leadoff walk in the fifth, but Peyton Jordan produced Point’s only hit against HHS with a two-out single to left in the sixth. The hosts also struck out at least twice in every inning except the fourth. The Lady Redskins used three hits, a walk and an error to produce a quick three-run lead in the first, then tacked on two more scores in the sixth for a 5-0 advantage. The guests doubled their lead by plating five runs in the top of the seventh for a double-digit cushion. Hurricane produced 15 hits and left six on base. Point Pleasant committed both errors in the game and also left two on the bags. Harlie Vannetter was the winning pitcher after allowing a hit and two walks over seven scoreless innings while striking out 15. Rylee Cochran took the loss after surrendering 10 earned runs, 15 hits and two walks over seven frames while fanning two. Lindsey Phared, Caitlin Mathes, Taylor McCray, Zoey Dunlap, Regan Schultz and Emily Bennett all had two hits apiece for the victors. Schultz also drove in a team-best three RBIs. Independence took a 1-0 edge in the top of the first as Ashleigh Sexton used a walk, passed ball, wild pitch and a groundout to cross home plate. The Lady Knights built a 2-1 lead in the bottom of the third against IHS as Jordan tripled home Hayley Keefer, then scored on a Tayah Fetty single one batter later. The Lady Patriots, however, countered with three runs in the fourth and another in the fifth to secure a 5-2 cushion. Kit Stroud started the bottom of the sixth with a walk, then advanced to second on a single by Julia Parsons. Madilyn Keefer then reached safely on a one-out error that allowed Stroud to score — cutting the deficit down to 5-3. Nine-hole hitter Hayley Keefer followed with a three-run homer to centerfield, giving Point a 6-5 advantage. IHS went down in order in the top of the seventh, giving PPHS the one-run triumph. The Lady Knights outhit the guests by an 8-6 overall margin, with both teams committing two errors apiece in the contest. Point stranded five of the nine runners left on base as well. Stroud was the winning pitcher of record after allowing four earned runs, six hits and one walk over seven innings while striking out one. Leah Vickers took the loss after surrendering two runs (one earned) and one hit in two-thirds of an inning of relief. Jordan and Hayley Keefer led the hosts with two hits apiece, followed by Fetty, Stroud, Parsons and Lillian Hill with a safety each. Hayley Keefer also drove in three RBIs and scored twice for the victors. Sarah Bragg led IHS with two hits and two RBIs. Sexton scored a team-best two runs. Point Pleasant traveled to River Valley on Monday and returns to action Tuesday when it hosts Meigs at 5:30 p.m.